Headquartered in Oak Creek, Master Lock Company, LLC, is a subsidiary of Illinois-based Fortune Brands Home and Security, Inc. The Master Lock Company, including its Master Lock, American Lock, and SentrySafe brands, had net sales of $552 million in 2015. At its height in the 1980s and 1990s, Master Lock employed 1,300 workers at its Milwaukee factory located at 2600 N. 32nd Street in the Metcalfe Park neighborhood. Although Master Lock employed only 412 employees at its factory as of 2012, the company was the only major manufacturing enterprise remaining in what was once a primary industrial corridor for Milwaukee. After outsourcing much of its production in the 1990s, Master Lock has become a twenty-first century example of repatriating manufacturing to the United States. In 1921, Harry Soref, with investments from two friends, founded the Master Lock Company. Soref, a Russian Jewish immigrant without any formal American education, invented and patented the laminated padlock. 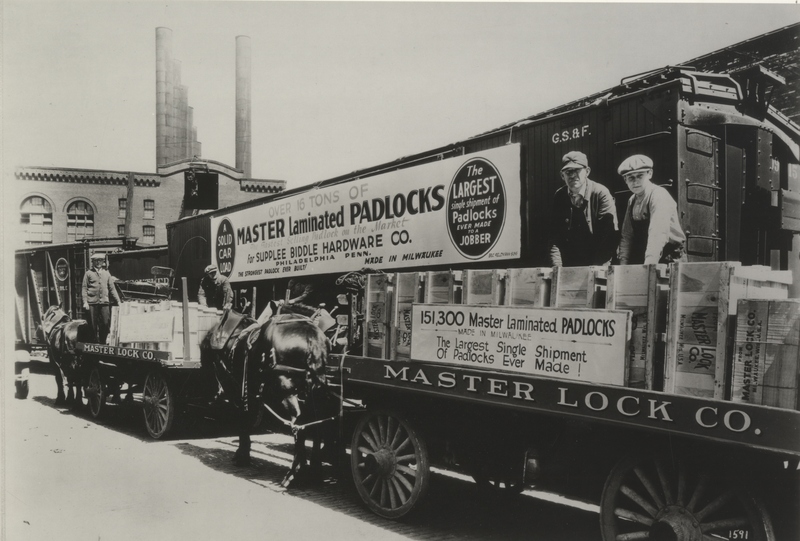 Master Lock took up early residence in the Pabst Brewery (which had space to rent thanks to Prohibition) before establishing its factory and headquarters on the north side in 1939. Master Lock’s factory became one of the main employers in this sector of the city by the mid-twentieth century. Henry Soref instituted innovative styles and policies at the new factory in order to increase production and employee morale. The interior was painted in a variety of colors and included glass block windows to allow in the light. For many years, the company eschewed time clocks, relying instead on an honor system for its predominantly female workforce. In 1957, Harry Soref died. The Soref family maintained control of the company until familial discord led to its 1970 sale to American Brands, Inc., later renamed Fortune Brands. In 2011, Fortune Brands spun off its home and security business, including Master Lock, as the independent Fortune Brands Home and Security, Inc.
As part of American and Fortune Brands, Master Lock continued to expand. While Master Lock employed about 1,050 corporate and manufacturing workers at the time of the acquisition, that number increased to 1,300 by the mid-1980s. The company’s American market share rose correspondingly, reaching 70% by 1994. During this same era, Master Lock introduced a string of famous Super Bowl advertisements. Spanning a decade, these commercials featured marksmen unsuccessfully attempting to break open padlocks by shooting them. While business expanded, tensions increased between Master Lock executives and its unionized labor force. In 1980, the United Auto Workers led a twelve-week strike at the factory. Although relations improved in the wake of this strike, Master Lock began outsourcing its production to China and Mexico in the 1990s. The company moved its headquarters to Oak Creek in 2003, leaving only 320 production jobs at the Metcalfe Park factory. Less than two decades later, citing increasing costs in China, Master Lock began returning production to its Milwaukee factory. In 2012, President Barack Obama praised Master Lock for returning manufacturing to the United States in both his State of the Union address and a visit to the Milwaukee factory. ^ Lee Hawkins, Jr., “Master Lock Moving Headquarters out of City,” Milwaukee Journal Sentinel, November 1, 2002, https://news.google.com/newspapers?id=RKkaAAAAIBAJ&sjid=JUEEAAAAIBAJ&pg=5112%2C771606; John Schmid, “Master Lock Reassessing China,” Milwaukee Journal Sentinel, January 1, 2011. ^ Fortune Brands, 2015 Annual Report, February 25, 2016, , accessed April 6, 2016; “The Master Lock Company,” The Master Lock Company website, accessed April 6, 2016. ^ “Master Lock Committed to Staying in City,” Milwaukee Sentinel, September 3, 1984, https://news.google.com/newspapers?id=TCQWAAAAIBAJ&sjid=UhIEAAAAIBAJ&pg=4949%2C210268; Mervin C. Nelson, “Master Lock Co. Lives up to Its Name,” Milwaukee Sentinel, February 17, 1969, https://news.google.com/newspapers?id=eUMxAAAAIBAJ&sjid=UREEAAAAIBAJ&pg=7409%2C3517441; John Schmid, “Master Lock Succeeds as Surrounding Area Fails,” Milwaukee Journal Sentinel, February 13, 2012. ^ Schmid, “Master Lock Succeeds as Surrounding Area Fails;” John Gurda, Milwaukee: City of Neighborhoods (Milwaukee: Historic Milwaukee, Inc., 2015), 245, 247. ^ Ruth Sklar Coleman, The Harry Soref Story: A Legacy of Mind and Heart (Milwaukee: Master Lock, 2003), 4, 16. ^ Coleman, The Harry Soref Story, 1-2, 16. ^ Coleman, The Harry Soref Story, 13, 16-17. ^ John Schmid, “Where City Factories, and Now Babies, Die,” Milwaukee Journal Sentinel, November 12, 2011. ^ Master Lock Company, The Story behind Your Master Padlock (Milwaukee: Master Lock, 1956), . ^ Nelson, “Master Lock Co. Lives Up to Its Name;” J. Earl Provencher, “Color Psychology: A Major Production Tool and a Fine Morale Booster,” Production, June 1955, 66. ^ Coleman, The Harry Soref Story, 15-16. ^ Fortune Brands, 2015 Annual Report, . ^ Lee Hawkins, “Key to a Turnaround” Milwaukee Journal Sentinel, August 28, 2000, https://news.google.com/newspapers?id=GLIaAAAAIBAJ&sjid=ri8EAAAAIBAJ&pg=4908%2C8127681. ^ Erik Gunn, “Master Lock, Union Find Cooperation Is Key,” Milwaukee Journal, February 14, 1989, https://news.google.com/newspapers?id=RGcaAAAAIBAJ&sjid=zysEAAAAIBAJ&pg=6886%2C5229641. ^ John Schmid, “Master Lock Reassessing China,” Milwaukee Journal Sentinel, January 1, 2011; Lee Hawkins, Jr., “Union Slams Master Lock,” Milwaukee Journal Sentinel, July 8, 2000, https://news.google.com/newspapers?id=-CQeAAAAIBAJ&sjid=zY4EAAAAIBAJ&pg=6263%2C6172110. ^ “Remarks by the President in State of the Union Address,” White House: Office of the Press Secretary website, January 24, 2012, accessed April 6, 2016; “Remarks by the President on American Manufacturing,” White House: Office of the Press Secretary website, February 15, 2012, accessed April 6, 2016. Coleman, Ruth Sklar. The Harry Soref Story: A Legacy of Mind and Heart. Milwaukee: Master Lock, 2003. Master Lock Company. The Story behind Your Master Padlock. Milwaukee: Master Lock, 1956.